Preheat oven to 350° F. In a 8 to 9-inch cast iron skillet, melt butter over medium-high heat. Add chicken and cook all the way through. Transfer to a small bowl. Spray skillet with nonstick olive oil spray, Toss quinoa, Progresso™ soup, 1 cup French fried onions, garlic powder and onion salt together in skillet. Add salt and pepper to taste. 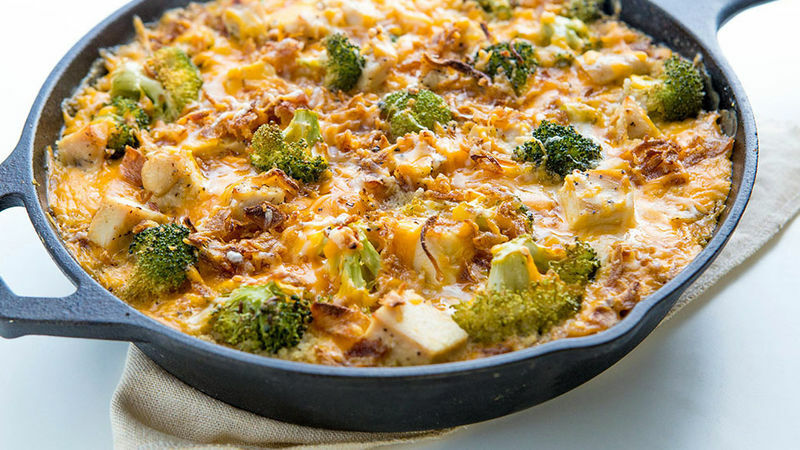 Add chicken and broccoli to top. Sprinkle with cheddar and remaining French fried onions. Bake for 25-35 minutes, or until cheese is melted and begins to bubble around the edges. Serve immediately and enjoy!